Plagron Sugar Royal is a very powerful organic stimulator, that is made from amino acids. The combination of ingredients enhances the production of chlorophyll, increasing the sugar levels in your plants. 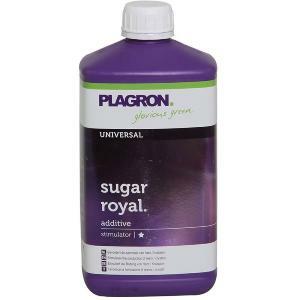 Some of the amino acids in Plagron Sugar Royal will push your plants to react as though they are going to dry out and they will naturally try to protect themselves in the best possible way, by maximising their sugar production. The increase in sugar levels will lead to a sweeter tasting crop with a much stronger fragrance. If you want the best results possible from your crop, we highly recommend you use Plagron Sugar Royal during your plants flowering period, combined with Plagron Green Sensation a powerful flowering stimulator that contains enzymes and an extra dose of organic phosphorus and potassium, for the optimum results. Plagron Sugar Royal can be applied to your plants from the second week of the growth stage and it can be used all the way through your plants flowering cycle, until one week before harvest. For soil and coco substrates, Sugar Royal should only be applied to your plants once a week at the rate of 2ml per litre of water. For hydroponics, Sugar Royal can be added to your tank weekly at the rate of 1ml per litre of water. If combining Sugar Royal with Green Sensation add only 1ml per litre of water.